To join easily the opening day of the 5th Populus Summorum Pontificum pilgrimage and pray in Norcia with Abp. Alexander K. Sample, just follow the instructions given by the Via Sacra agency, partner of the pilgrimage. Download here the instructions file. On this Feast of the Immaculate Conception, which ushers in the Jubilee Year, the Cœtus Internationalis Summorum Pontificum (CISP) gladly confirms the dates and general organization of the fifth Summorum Pontificum pilgrimage at the tombs of the Holy Apostles. 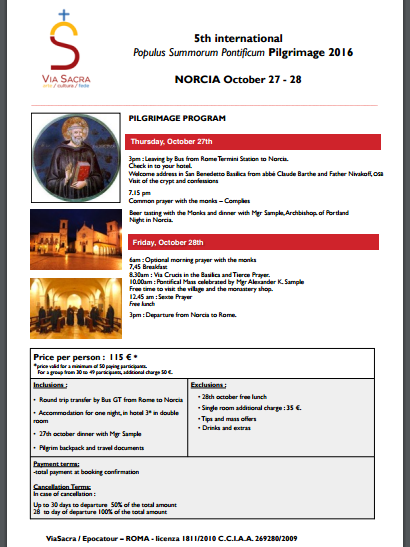 The pilgrimage will get on its way on Thursday 27 October at about 3pm with a bus ride from Rome to Norcia, the birthplace of Saint Benedict. 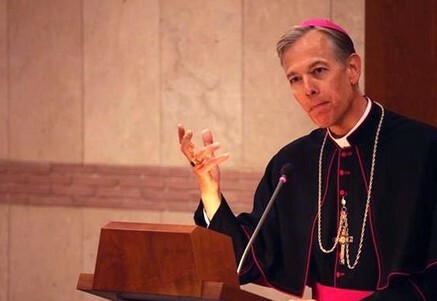 In Norcia the pilgrims will be greeted by the Benedictine monks there as well as by Archbishop Alexander K. Sample of Portland, Oregon, who will serve as their guide throughout the pilgrimage. On Friday 28 October morning, Abp. Sample will celebrate Mass in the Basilica of Norcia. That Friday evening the pilgrims will have returned to Rome and are invited to join in a torch-lit procession to celebrate the tenth anniversary of the Institute of the Good Shepherd. On Saturday 29 October, the people of Summorum Pontificum will follow in His Excellency’s footsteps across the threshold of the Holy Door and attend the pontifical Mass celebrated at noon in Saint Peter’s Basilica (name of celebrant to be announced). Lastly, on Sunday 30 October, Archbishop Sample will bring this fifth international pilgrimage to a close by celebrating the Feast of Christ the King in Santa Trinità dei Pellegrini Church. The logistics of that exceptional day in Saint Benedict’s birthplace has been entrusted to the Via Sacra agency. UPDATE (November 2015): the #sumpont2016 pilgrimage will take place from Thursday, October 27 to Sunday, October 30. And will begin in Norcia, on the birthplace of St. Benedict! In 2016, the fifth pilgrimage of the people of Summorum Pontificum at the Apostle’s tomb will coincide with the closing of the Holy Year of Mercy that our Holy Father Francis decreed. Today, on the Feast of Corpus Christi in 2015, the CISP gladly announces to all the pilgrims that Archbishop Alexander K. Sample of Portland has already accepted the invitation to join them, to guide them throughout this pilgrimage, and to cross the threshold of the Holy Door with them. The CISP thanks His Excellency for his availability and assures him of its fervent prayers as well as of those of the pilgrims for his apostolate and the faithful of Portland. The practice of pilgrimage has a special place in the Holy Year, because it represents the journey each of us makes in this life. Life itself is a pilgrimage, and the human being is a viator, a pilgrim travelling along the road, making his way to the desired destination. Similarly, to reach the Holy Door in Rome or in any other place in the world, everyone, each according to his or her ability, will have to make a pilgrimage. This will be a sign that mercy is also a goal to reach and requires dedication and sacrifice. May pilgrimage be an impetus to conversion: by crossing the threshold of the Holy Door, we will find the strength to embrace God’s mercy and dedicate ourselves to being merciful with others as the Father has been with us.